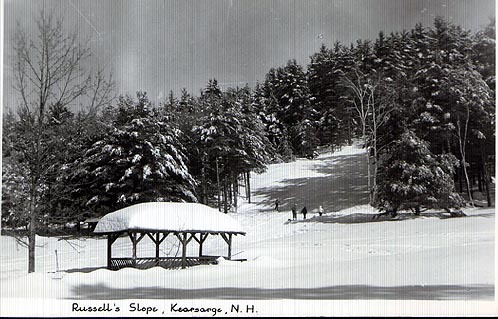 Russell's Slope was located in Kearsarge, NH and was operated by Russell's Inn. Originally, skiers would hike up and ski down this area. In 1939 it was described as being located opposite to Russell cottages, with an easy grade and a width of 200 feet. The area installed a 900 foot rope tow in 1948, which operated until at least 1953. Here's a picture of Russell's Slope, likely before the tow (however, the tow may be on the left side of this slope, just can't quite see it). Jim Doig has more info on this area: now live in Topsfield MA and one of my neighbors who died this past January used to go to NH in the late 40's. His name was John Nutter and he built a rope tow at Russell's in 1947 that was powered by a Model A Ford. In 1948 he again returned to Russell's and powered the rope tow with a Buick. The first lift was run from the bottom of the hill while the second one was taken to the top of the hill and run from there. John was an inventor and tinkerer and the typical old yankee who could make or fix anything from almost nothing. I saw home movies he had made from Russell's a few weeks before he died and I also remember skiing this rope that dragged us up the hill at the age of 5 years old. The Skimobile at Cranmore was a much easier lift for a kid who probably weighed about 60 pounds in 1948. Do you remember this area? Let us know if so.